Elvis Presley was born on January 8, 1935, in Tupelo, Mississippi to Vernon Elvis Presley, and Gladys Love Presley (Smith was her maiden name), in the two-room shotgun h Elvis Presley was born in Tupelo Mississippi, on January 8, 1935 having been delivered by the local doctor via a “house call” (i.e. the physician came to the home as opposed to a hospital) . This home was built by Vernon Presley, Elvis father, in the type of home known, in the south, as a “shotgun house” which meant that if you were to shoot a shotgun standing in the front door it would go all the way through the house without hitting anything else while passing through the back door (I.e. there were no walls other than the 4 exterior walls). Jesse Garon Presley, who was Elvis identical twin brother, was delivered (approximately) 35 minutes before him, (sadly) stillborn. As an only child, Elvis became close to both parents and formed an unusually tight bond with his mother. The family attended an Assembly of God church where he found an outlet for his musical inclinations. Johannes Valentin Bressler, the founder of the Presley family in America, was born in the Palatinate, Germany, 1669 in the village of Hochstadt (where the Preslar family was first mentioned in 1494); Valentine was employed there as a vine dresser; he married Anna Christiana Franse (Born Germany 1674) and immigrated to New York in 1710; with some French Norman; one of Gladys’ great-great-grandmothers was Cherokee Indian and, according to family accounts, one of her great-grandmothers was Jewish. Gladys was regarded by relatives and friends as the dominant member of the small family. 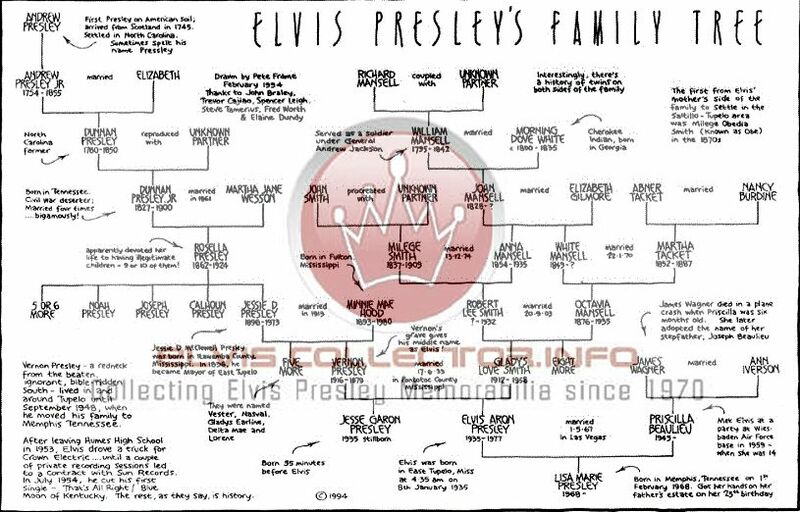 Elvis Presley descended from the Bressler (Presley) line, the name being Americanized down the line, first into Preslar, then Pressley and finally Presley but only because his Great Grand Mother, Rosella Pressley adopted her maiden name for her children. She never did tell any of her children who their father was. Rosella bore nine ‘illegitimate’ children, never once identifying to her children who their fathers were. Rosella stubbornly, and resourcefully, supported them through sharecropping. Mrs. Doshia Steele, one of Rosella’s daughters, said this of her plight. ‘I can’t remember anyone ever talking about who our father was, It was a big mystery when we were children. My mother just didn’t talk about it’. Rosella, internalized the abandonment and re-enacted it throughout her life. Beginning at age nineteen and continuing over 28 years. Rosella’s son, Jessie D. McDowell (J.D.) Pressley (1896-1973) was Elvis’ Grand Father. He was born on April 9, 1896 in Itawamba County, Mississippi, to Rosella Presley, unmarried, and John Wallace (Elvis’ great-grandfather). So though the rightful (traditional) surname would have been Wallace, Rosella gave her children her own name, her maiden name of Presley. Elvis Grandfather, Jessie, J.D. Presley used the double ‘s’ before changing to the single ‘s’ after his great grandson attained international fame. Starting from the first time Elvis met Priscilla, while Elvis was in the US Army stationed in Germany and Priscilla was there with her family with her Father who was in actuality her step father a fact that was kept from her, there was an immediate mutual attraction. Though Elvis only met Priscilla a few months before being honorably discharged from the US Army, in March of 1960, and Priscilla was only 14 years old at the time (a fact that was contrary to her; looks, demeanor, maturity, outspokenness, and her outlook on life) Elvis had a deep caring for Priscilla that would eventually be consummated in their marriage on May 1, 1967. Elvis and Priscilla, through mutual shortcomings and actions adverse to the marital vows they took, (sadly) split up in 1972 and formally divorced with the final divorce decree issued on October 9, 1973. 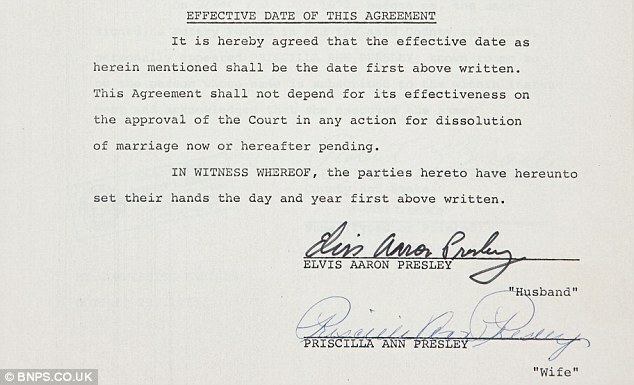 The property settlement agreement, dated August 15, 1972, was between Elvis Aaron Presley and Priscilla Ann Presley. It stated the couple had agreed to split the property to avoid further legal costs. It reads: ‘The parties were married on May 1, 1967 in Las Vegas, Nevada. ‘Unfortunate circumstances and unhappy differences have arisen between the parties by reason of which they have lived separate and apart since February 23, 1972, and by reason of which they intend to dissolve their marriage. Elvis signed over ownership of three of his prized possessions – a 1971 Mercedes-Benz car, a 1969 Cadillac El Dorado and a 1971 Harley Davidson motorbike. Priscilla had originally agreed to a cash settlement that was 7.5 times less than the amount she finally received. She signed the paperwork that confirmed she would receive a $100,000 tax-free lump-sum payment. The official document is at odds with the $750,000 payment she eventually received after she appointed new lawyers who advised her to seek more money. As well as Elvis’ cars and cash, actress Priscilla also stood to receive half the income from the sale of their three properties in California. 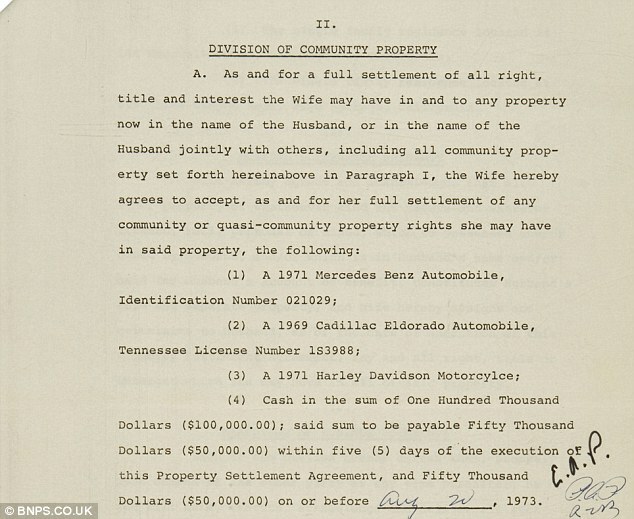 ‘The agreement granted Priscilla ownership of a 1971 Mercedes Benz, a 1969 Cadillac El Dorado, a 1971 Harley-Davidson motorcycle, $100,000 in cash, and half the income from the sale of their three houses in California. ‘It is initialed in ink by Elvis and Priscilla on page three and signed by them on page nine. Elvis’ divorce adversely effected him throughout the remainder of his life. Though he was blessed with the birth of his daughter, who he truly loved with all his heart being Lisa Marie born exactly nine months after the wedding, the reality that his marriage had ended contributed to his failing health which included mental, emotional, and addictive behavior. Elvis Presley endured his triumphs, and his failures, in the public eye. Fortunately, for us and for Elvis, he had an outlet to share his feelings…and his soul being his singing and performing. During the 1970s Elvis recorded several poignant songs that, to this very day, resonate as they apply to those going through separation, divorce, children of divorce, etc. This include, but are not limited to, these songs; Suspicious Minds, You Gave Me A Mountain, My Boy, Separate Ways, It’s Over, It’s Easy For You, Always On My Mind, etc. Lastly, Elvis loved Priscilla and she loved him. They both made mistakes and both contributed to the deterioration of the marriage. They were, are, and will be (simultaneously) an American (with an assist from Germany) Love Story as well as an American Divorce Story. This is part of the life, and legacy, of Elvis Presley that continues to fascinate Elvis Presley Fans Worldwide.